Attended with representatives from Chubby Botak Koala, Purple Taste, and msginginly. Spent about SGD $104 per person. Hyde & Co. is 1 year young! 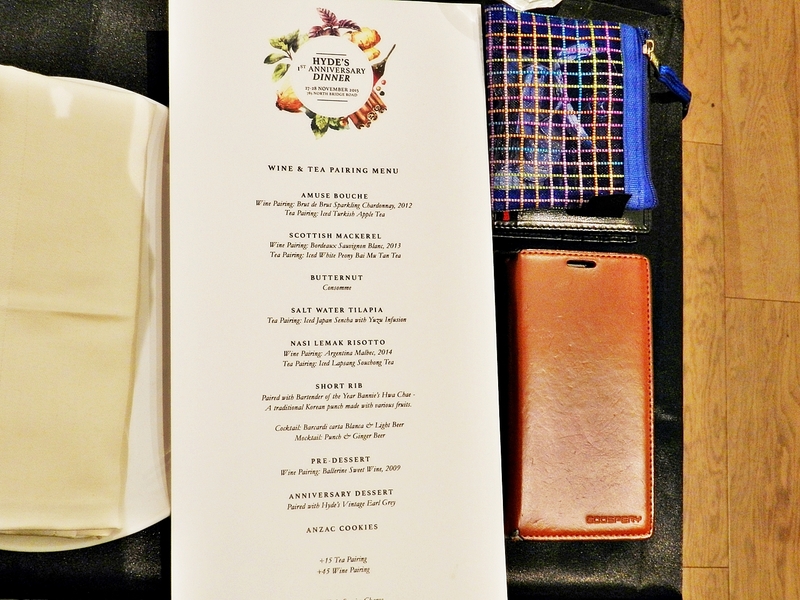 As part of their milestone celebrations, Hyde & Co. held their 1st Anniversary Dinner on 27 - 28 November 2015, creating a pop-up dinner experience. 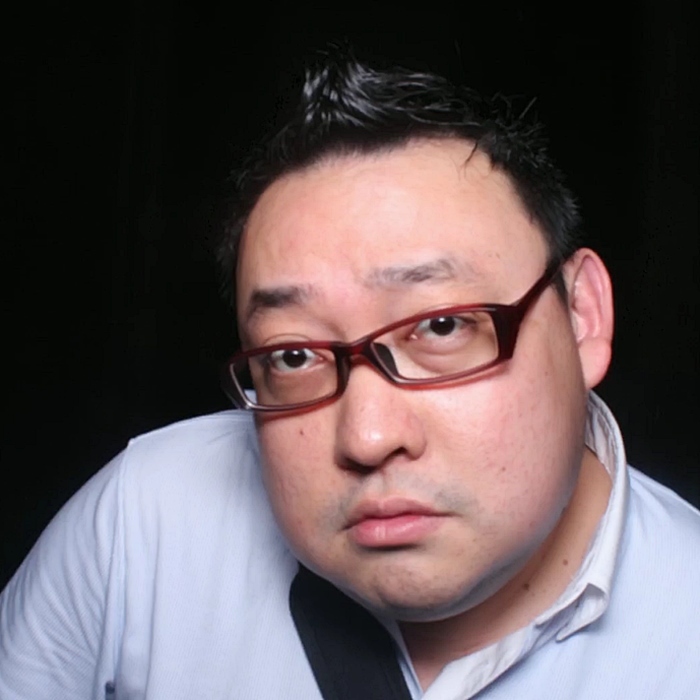 Guest chef Pang, alongside Hyde & Co. chef Nazlie, created a 10-course menu with wine / tea pairings. 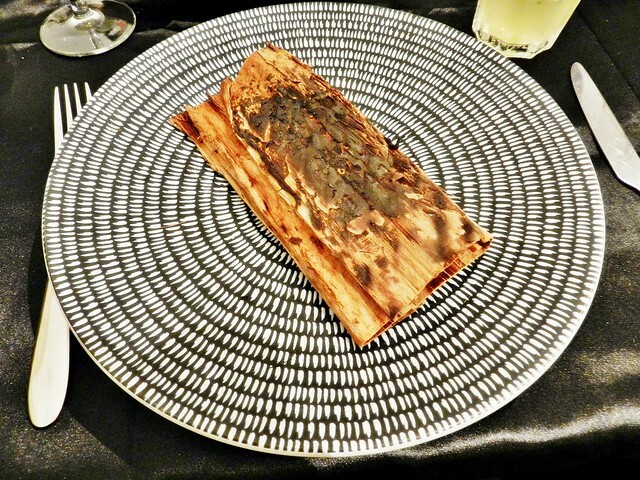 We were lucky to be able to experience this one-of-a-kind, never to be repeated, modern gastronomy dishes! 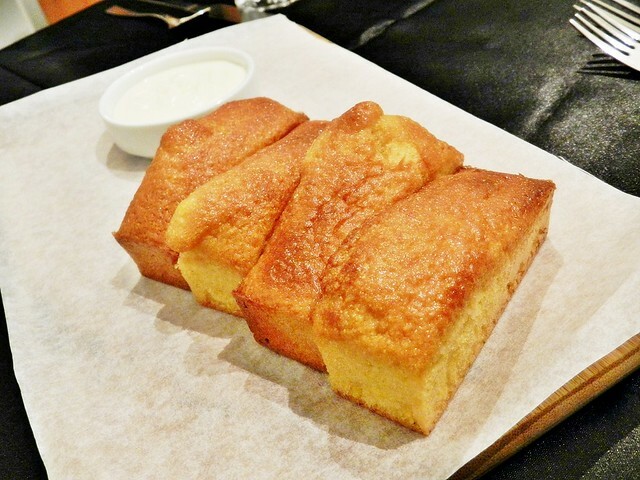 We started with some Home Made Corn Bread, crumbly and moist within, but also quite dense in texture. 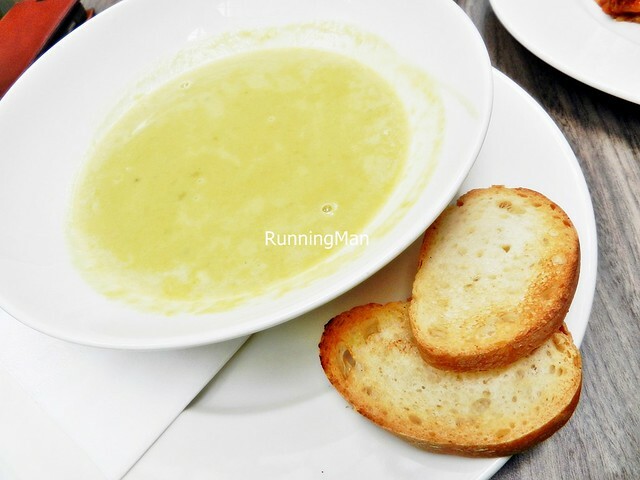 The delicate taste of sweet corn was lovely, and complements the sharp sourness of the Greek yoghurt on the side. I decided to try the tea pairing. 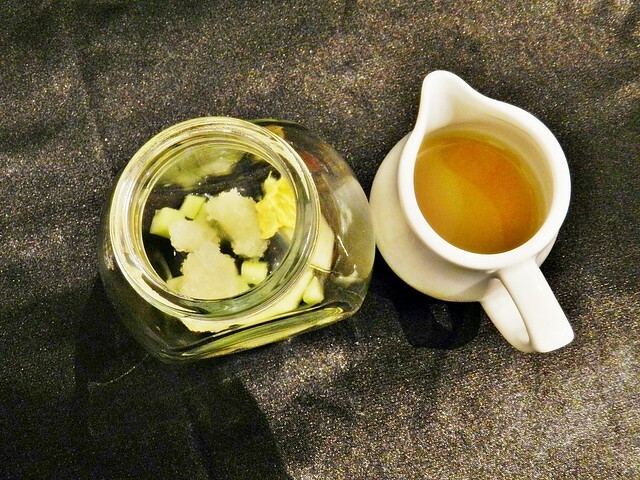 The Iced Turkish Apple Tea, with its flavours of sweet yet tart Moroccan apples, has a mellow creaminess, served with a rim of sugar crystals. This lively fruit tea blend pairs well with the varied intense flavours of the Amuse Bouche, acting as a palate cleanser. 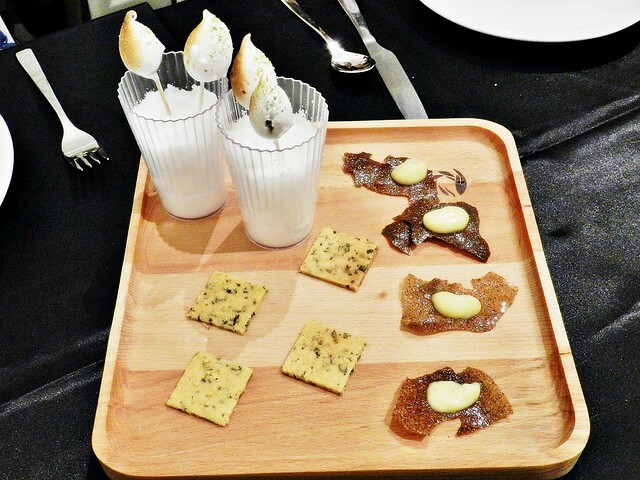 The Amuse Bouche features a trio of lovingly crafted canapes. 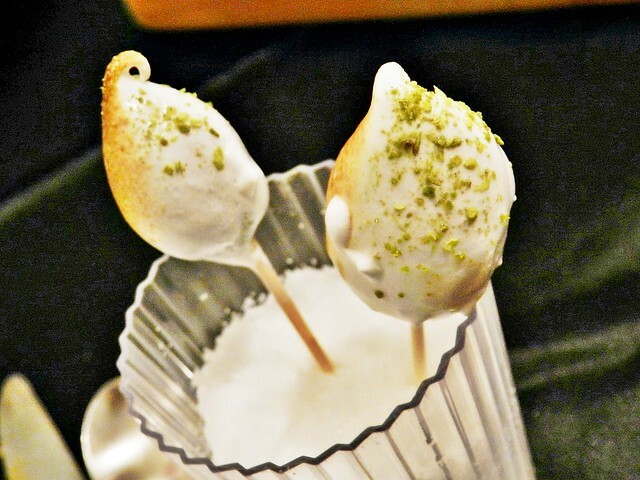 The Meringue Coated Caper Berry Lollipop had the intensely sour and juicy caper berries, followed by the smooth creamy texture of the meringue, and a hint of earthy, grassy taste from the green tea / matcha powder. The Wild Rice Cracker, Smoked Chipotle Mayo has that super crispy, deep flavour of oat and rice in the cracker, followed by the savoury smoky, slightly spicy chipotle mayonnaise. The crumbly Butternut Cookies, Wakame Seaweed has a rich buttery flavour, and a hint of grassy, salty taste from the wakame seaweed. The Iced White Peony Bai Mu Tan Tea is a rare white tea, whose tea leaves are picked in early Spring, with a clean, delicately sweet, refreshing taste, rather like drinking the freshest spring water. It contrasts well with the strong, savoury salty flavours of the Scottish Mackerel 2 Ways (Poached & Cured). 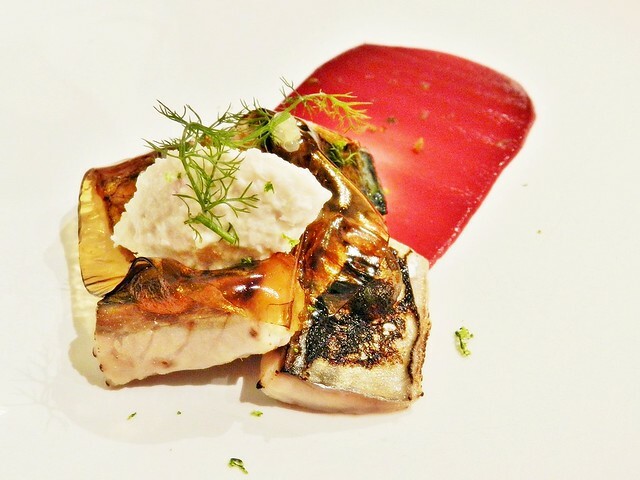 Loved the Scottish Mackerel 2 Ways (Poached & Cured), With Teriyaki Jelly, Horseradish, Beetroot Puree! The savoury salty Scottish mackerel fish was marinated in a brine overnight, and is very tender, coated in a Pedro Ximenez sherry sauce. The teriyaki jelly lends a slight savoury sweet taste, with the horseradish is mixed with creme fraiche to reduce some of its spicy sharpness. The beetroot puree lends a sweet, earthy taste to the dish. Excellent! The Butternut Consomme, Espuma, Soba is served in 2 parts, the visual aspect is when it arrives at your table, with the reduction of butternut looking so pretty in the cup. 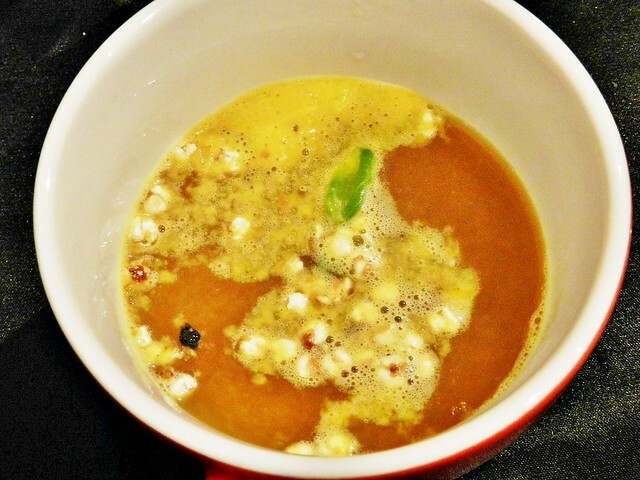 The thin but potent soup / broth is then poured in, creating a sweet savoury soup / broth that is completely delicious! 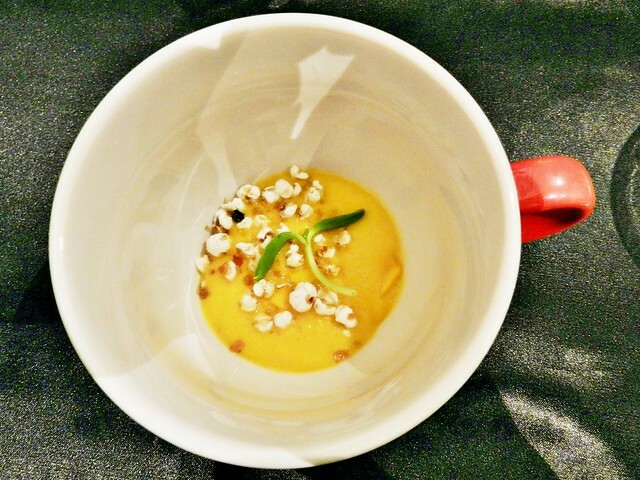 The toasted corn kernels lend a crunch to texture, keeping this dish interesting! 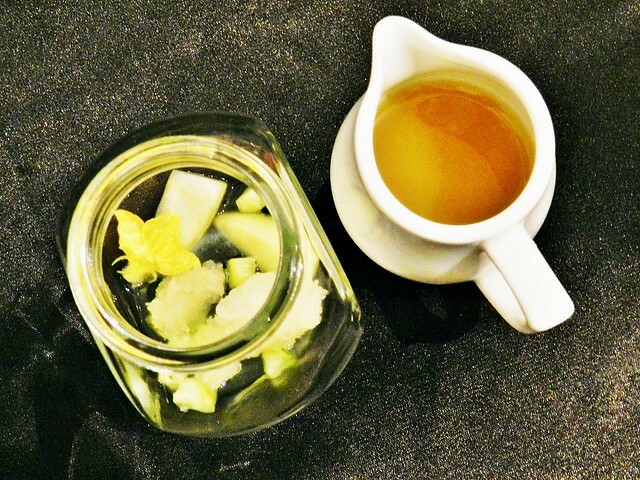 The Iced Japanese Sencha With Yuzu Infusion is a delicate green tea, harvested in the 1st crop season. 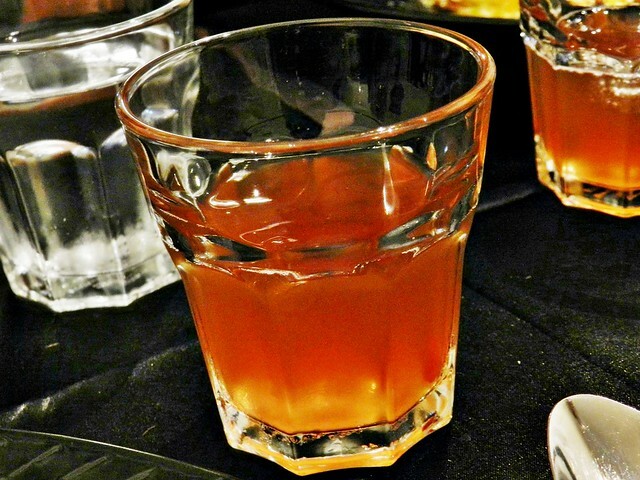 Infused with the zesty yuzu creates a layered taste within the beverage, of earthy, citrusy notes. Refreshing, and it helps to tame the stronger flavours of the Salt Water Tilapia, Paperbark, Salt Brush, Gremolata. 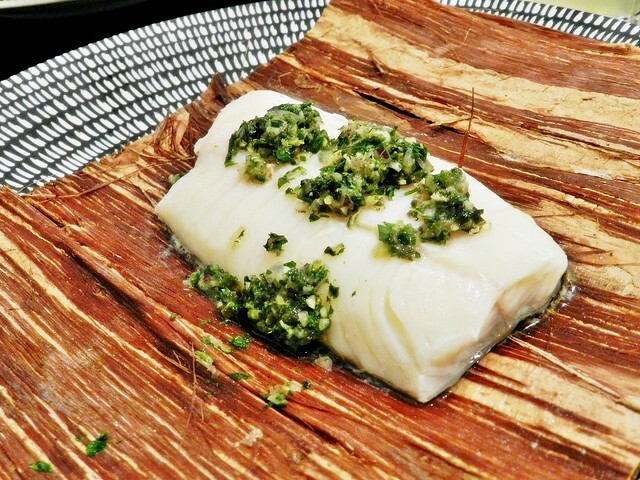 Inspired by Australian Aboriginal cooking methods, the Salt Water Tilapia, Paperbark, Salt Brush, Gremolata is steamed in a traditional paperbark, locking in the moisture to the fish, while making it tender and delicate in texture. 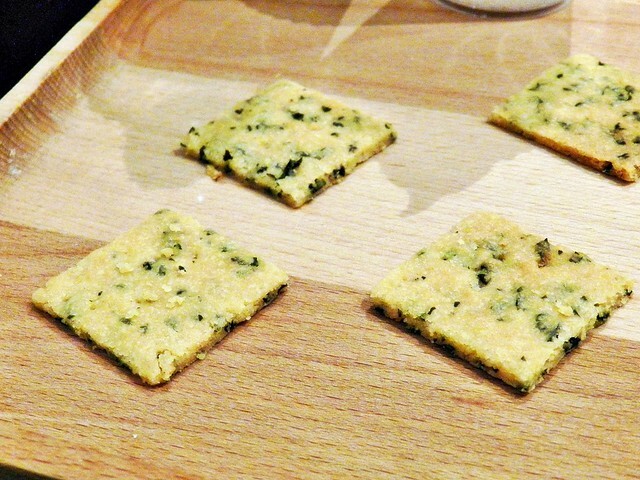 The slight salty taste is contrasted with the herb flavours of the gremolata. Excellent dish, loved it! 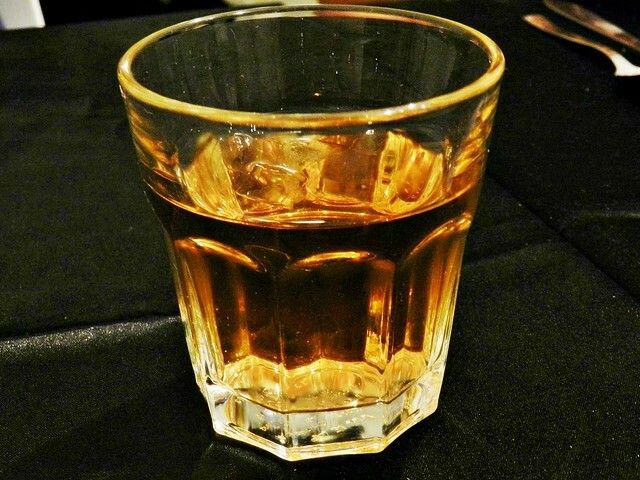 The Iced Lapsang Souchong Tea is a strong, large leaf black tea, with an intense, peaty, smoky taste. 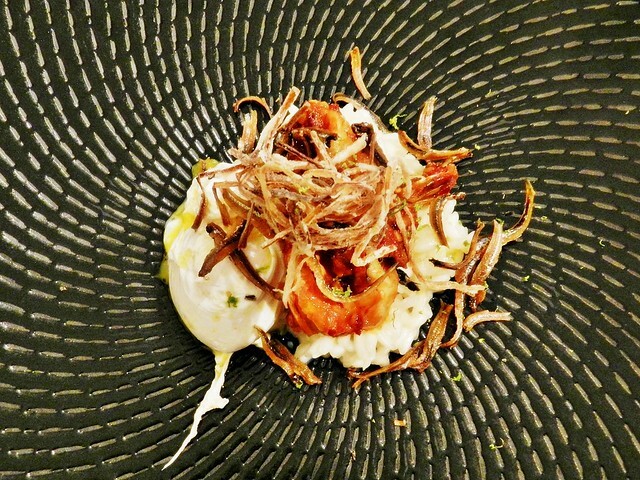 Created by being smoked over wood that's rich in resin, this tea pairs well with the spicy, complex flavours of the Nasi Lemak Risotto, Home Made Sambal Prawns, Poached Egg. 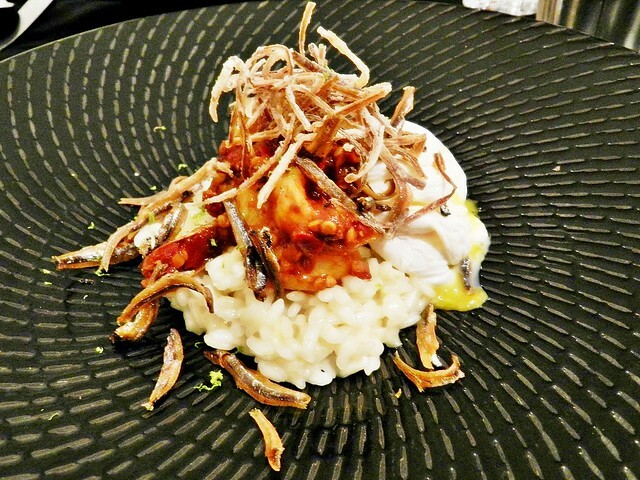 As the only dish from Hyde & Co. regular dinner menu to be featured, the Nasi Lemak Risotto, Home Made Sambal Prawns, Poached Egg (SGD $22) has a lemongrass and coconut infused risotto rice, fresh and meaty prawns coated in a spicy home made sambal, and a perfectly runny, poached egg. Topped with crunchy bits of fried ikan bilis / anchovies, this dish was filling, with punchy, spicy, savoury, sweet flavours all rolled in. 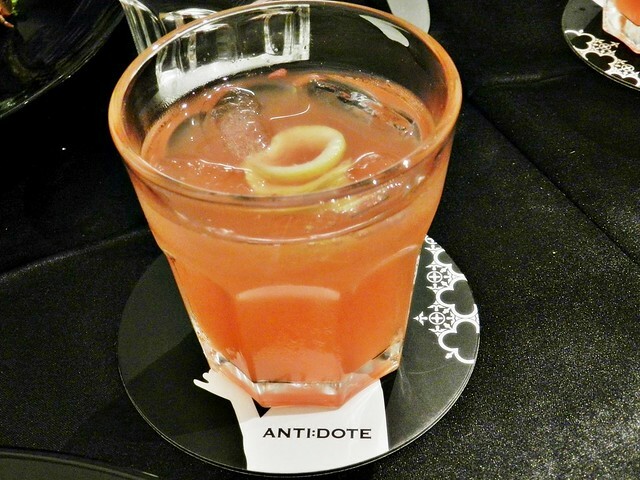 Inspired by Bannie Kang, the award-winning South Korean lady bartender at Anti:Dote, the Hwa Chae Mocktail is a watermelon fruit punch and ginger beer adaption of her competition cocktail. 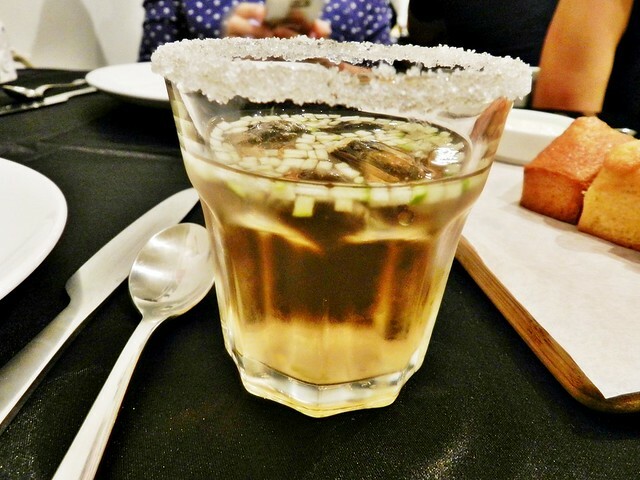 The fizzy, fruity taste of this mocktail goes well with the savoury, meaty flavours of the Short Rib, Cauliflower, Pickles, Cider. 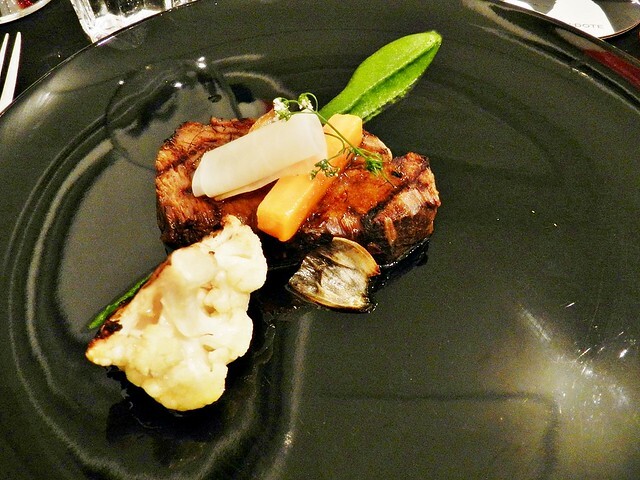 The star of the Short Rib, Cauliflower, Pickles, Cider is definitely the tender, savoury strip of short rib. The beef has been slow cooked overnight in a marinade, and is fork tender and moist. 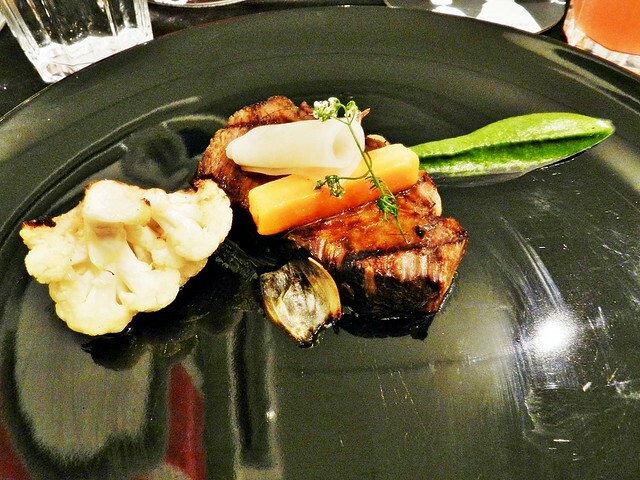 Topped with pickled carrot, daikon radish, and pearl onions, served with a herb sauce, and a roasted, lightly salted cauliflower cooked in beef fat! 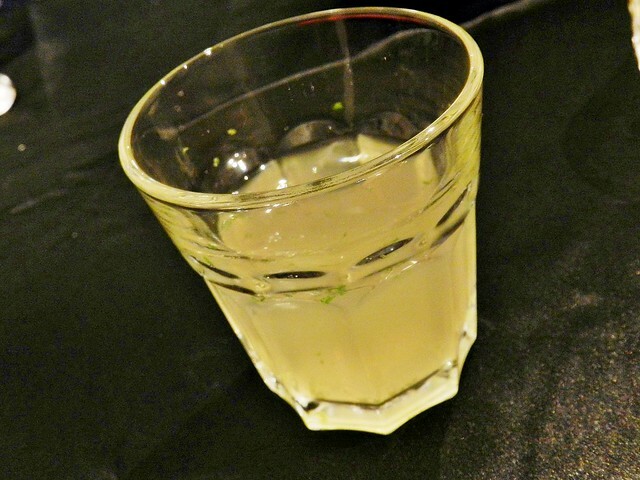 The fruity, floral Pre-Dessert Bergamot, Grape, Dill is a beverage palate cleanser. While I appreciate the chunks of fruit and flowers within the cute serving jar, it was a little hard to consume without a utensil. 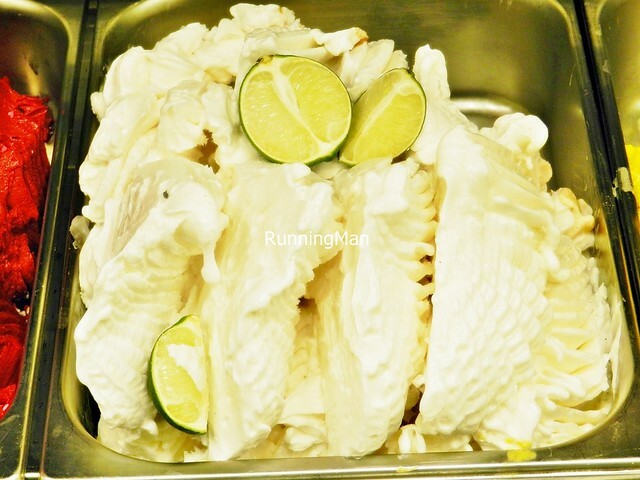 Still, it served it's purpose, with its refreshing, clean, fruity taste, and fragrant aroma. 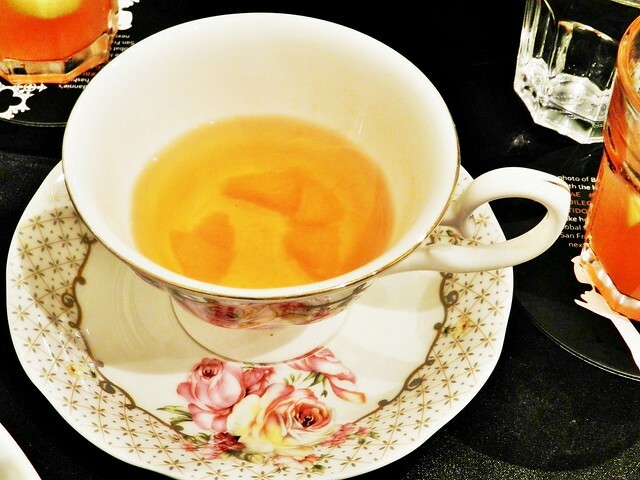 The Vintage Earl Grey Tea is a large leaf black tea grown at high altitudes. 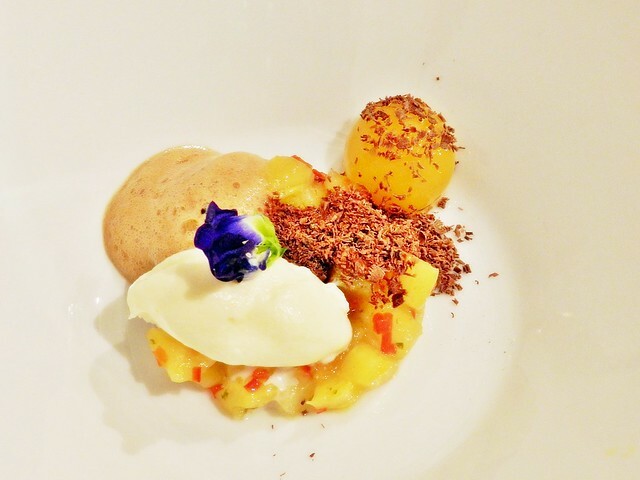 This tea is naturally scented with bergamot oil, and has a floral, delicate flavour that goes well with the complex, fruity flavours of the Anniversary Dessert, Pineapple Bits, Mandarin Marmalade, Vintage Earl Grey Espuma, Mascarpone, Mandarin Yolk. 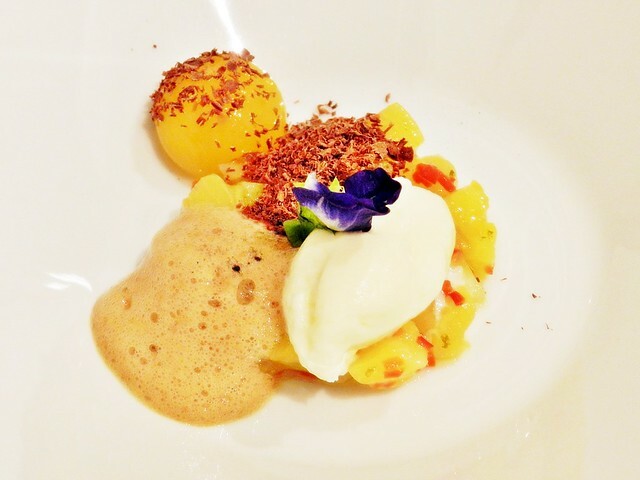 The Anniversary Dessert, Pineapple Bits, Mandarin Marmalade, Vintage Earl Grey Espuma, Mascarpone, Mandarin Yolk is a modern gastronomic delight. With taste notes of fruity, zesty, citrusy, sour, sweet, bitter, and textures of creamy, foamy, juicy, smooth, chunky, chewy; so good! Finished with some home made Anzac Cookies, a homage to Australia / New Zealand. 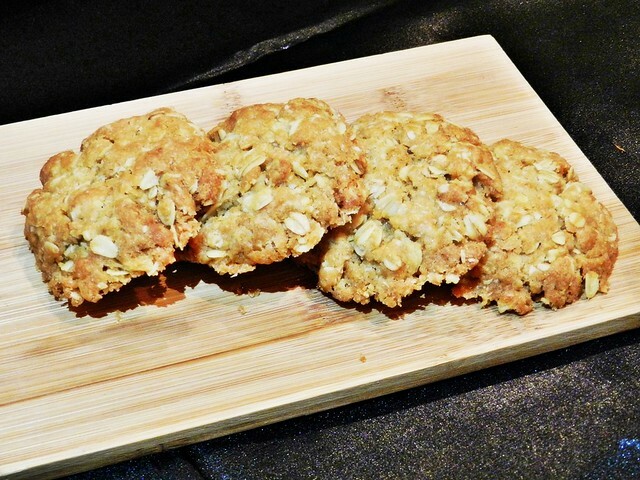 Soft, chewy oat biscuits, not too sweet in taste. Overall, has a great time at Hyde & Co. 1st Anniversary Dinner, more than just excellent food, the experience of sharing and conversing with the knowledgable chefs and owner was unforgettable. All the best in the years ahead! Obedience is the practical acceptance of the authority and will of God. It begins with submitting to God, and then expressing that submission in actions, words and thoughts. To be obedient is to be in agreement with God. To be disobedient is to yield to self-will instead of surrendering to God. 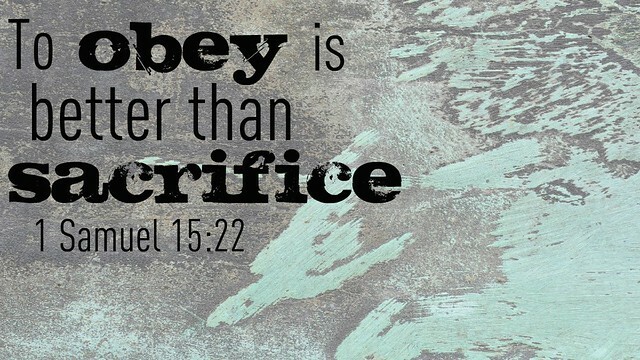 Lord Jesus, help me to simply obey you. To be obedient in the little things. Help me to be fully obedient, not just perform partial obedience, which is no better than disobedience. Spent about SGD $37 per person. 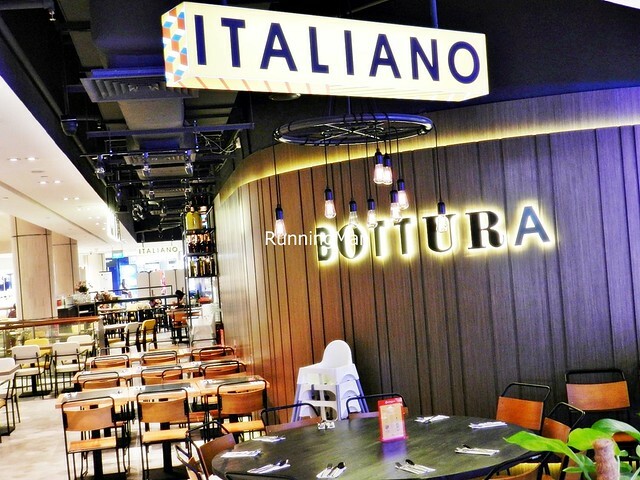 Bottura in Suntec City was opened in May 2015, by ex-banker and 5th generation Italian restaurateur Luca Bottura, a native of the city of Bologna in Emilia-Romagna, Italy, and cousin to 3-Michelin star celebrity chef Massimo Bottura of Osteria Francescana. 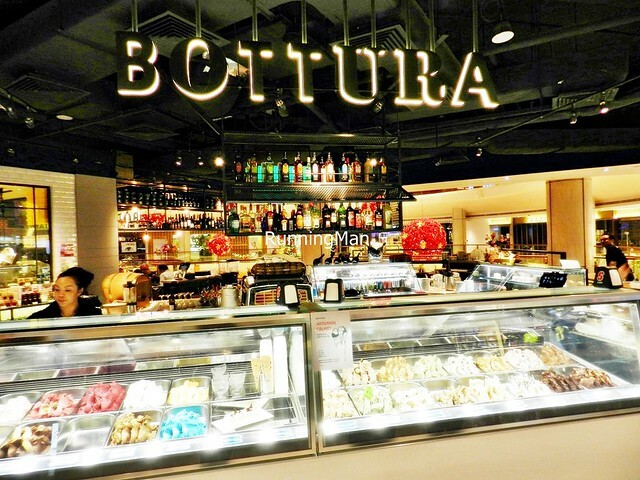 A multi-faceted concept store, Bottura is more than just a restaurant, also offering a cafe-lounge, a wine bar, a gelato bar, and a gourmet retail store stocked with imports from Italy! 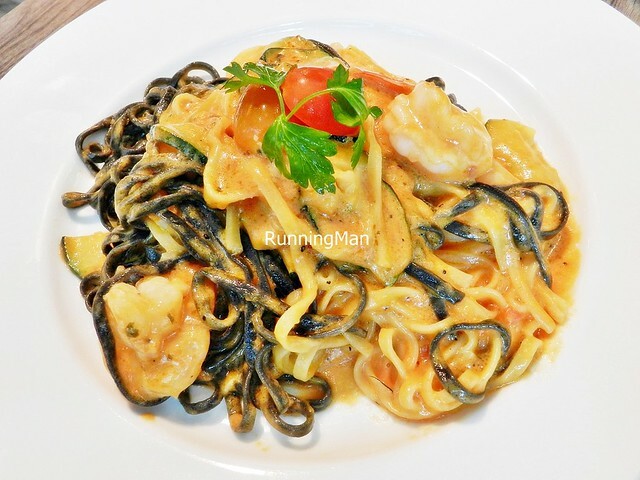 However, their main draw is still the Bottura restaurant, which offers decent, tasty Italian food in a casual setting, with affordable prices. Ambience at Bottura is akin to a casual bistro, with simple, modern furniture in tones of metal, wood, and black, neatly laid out within a wide open, spacious area. Its location comes with a balcony which overlooks the main foyer, great for people watching. Suitable place for business meals, or simply chilling with friends. The gourmet retail store itself is rather small and non-descript, you wouldn't even know it's there unless attention was called to it. I like the attractive and bright display of the gelato bar, great eye-catcher! 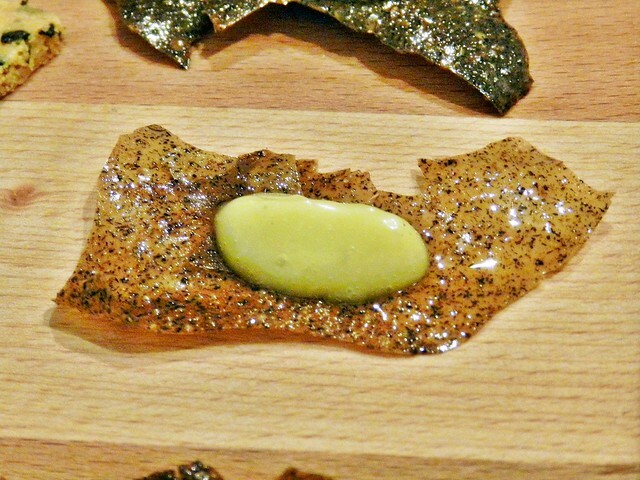 Service at Bottura is their weakest point. While I understand it's meant to be casual, staff aren't observant, and it takes quite a while to attract their attention even during non-peak periods, as they tend to stand around and talk amongst themselves. At least guests are quickly ushered to seats, and orders taken quickly as well. I do commend staff for being efficient at clearing empty / dirty tables, possibly the best thing about the service here. Also inconsistently performed is requesting for feedback, sometimes staff do so, and other times they don't. Oddly, despite being a tableside service restaurant, payment is self-service. 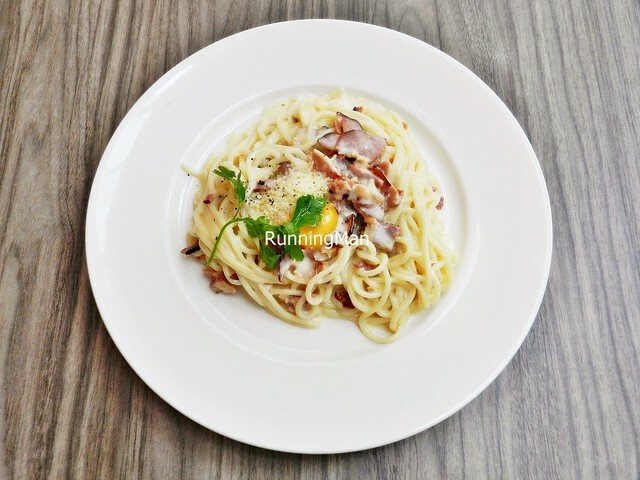 Food at Bottura is the closest to authentic Italian you'll find at a really affordable price range... so wallet-friendly that even students can dine here! 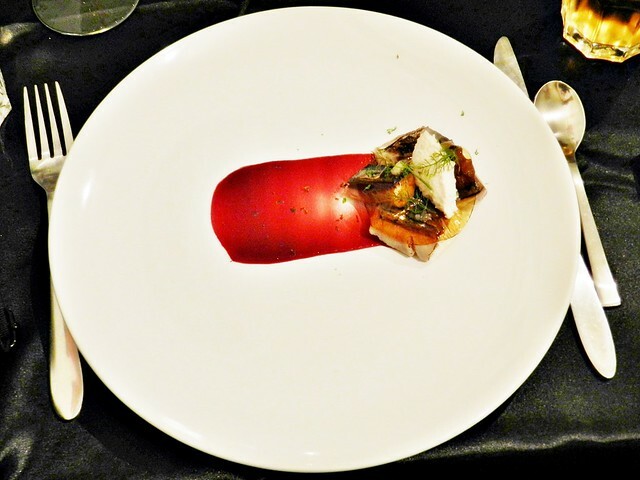 Portions are medium-sized to large, and usually very filling, making Bottura great value for money. On top of that, the taste of their Italian food is usually average / decent, to above average, though not the best I've had. 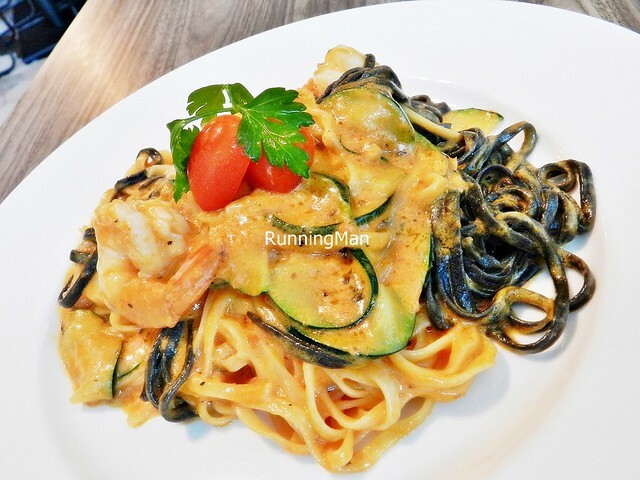 The highlights are their homemade pastas, made fresh daily, cooked till al-dente, and gently covered in tasty sauces. 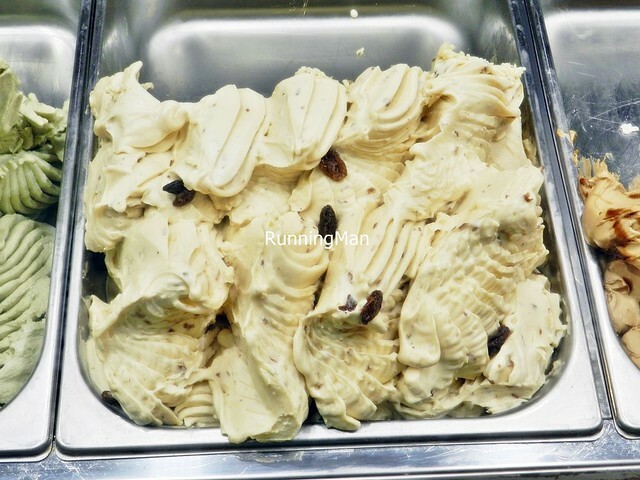 Even their bread and gelato are made in-house, thumbs up for the level of effort! Overall, Bottura is worth visiting for their decent, affordable Italian food, provided you can stomach the inconsistent service. 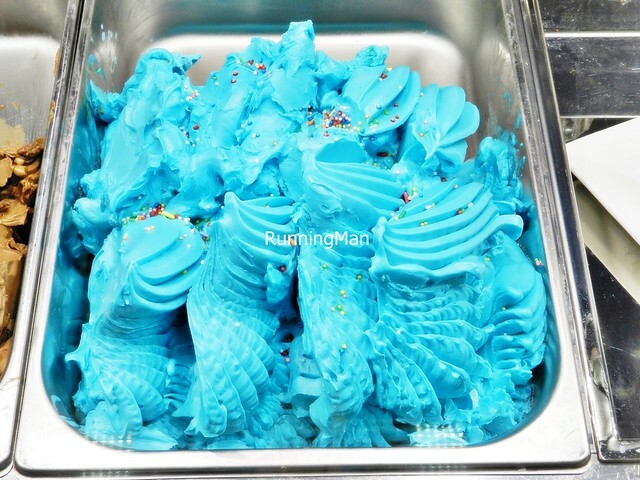 So many colourful and interesting flavours of gelato! 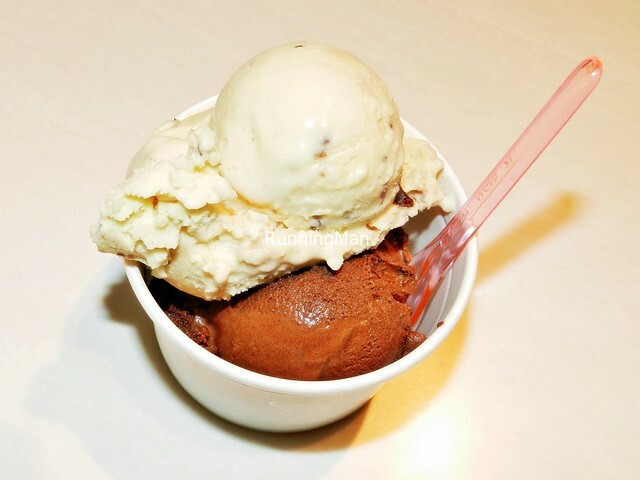 I tried the double scoop Gelato Scoop Of Mr. Tobby & Malaga (SGD $8), the Mr. Tobby has a deep chocolate flavour laced with an intensely sweet caramel swirl that was too overwhelming to finish. Much more palatable was the Malaga, their version of a rum & raisin flavour, with a nicely balanced taste of rum, the sweetness of raisins, and a nice creamy texture. Melts fast though. 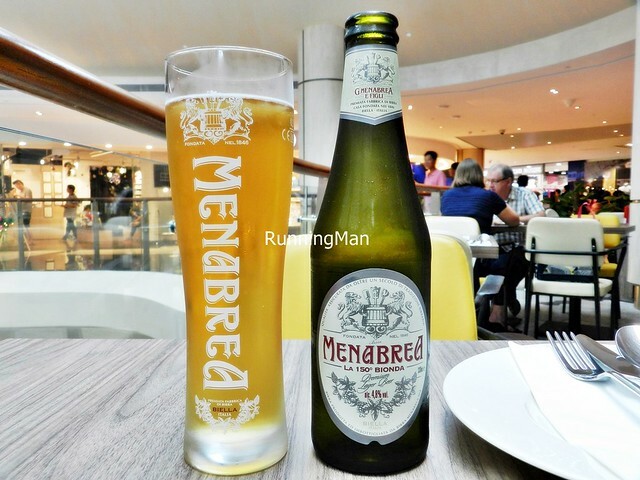 The Beer Menabrea Birra Bionda (SGD $10) is a bright golden premium lager brewed by Menabrea Birra / Menabrea Brewery in Biella, Piedmont, Italy, using natural spring water sourced from the Alps mountains. With a rounded body, aroma of sweet grains and corn, and flavours of malts, lemon, and slightly toasted grain, this very drinkable, light beverage has a moderate bitterness with a creamy mouthfeel that pairs well with fish or poultry. 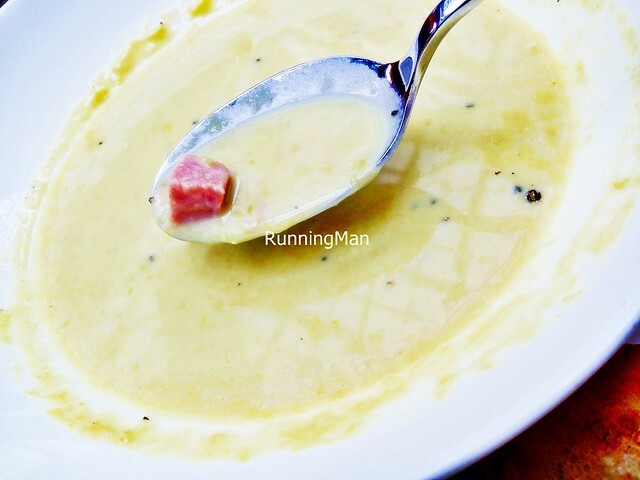 The rather salty Zuppa Piselli E Prosciutto / Pea And Ham Soup (SGD $10) has good pea flavour, grassy and bright on the palate, balanced by the salty, deep, meaty flavour of cured ham. Served with crisp slices of crostini / toasted bread, this would have been much better if they toned down the amount of salt within. 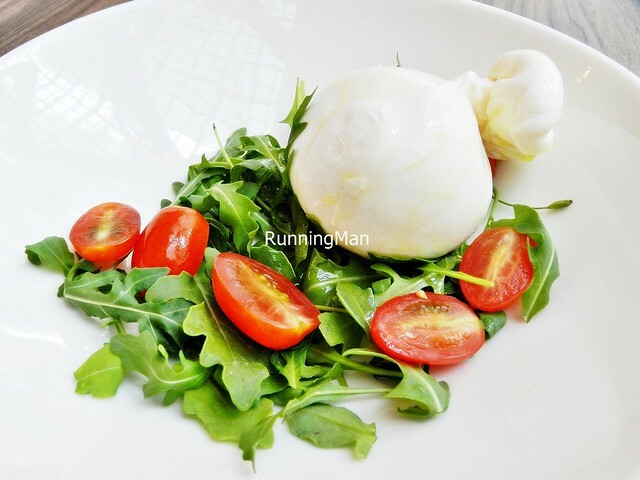 The Burrata (SGD $18) features a ball of semi-soft, mozzarella cheese and cream. 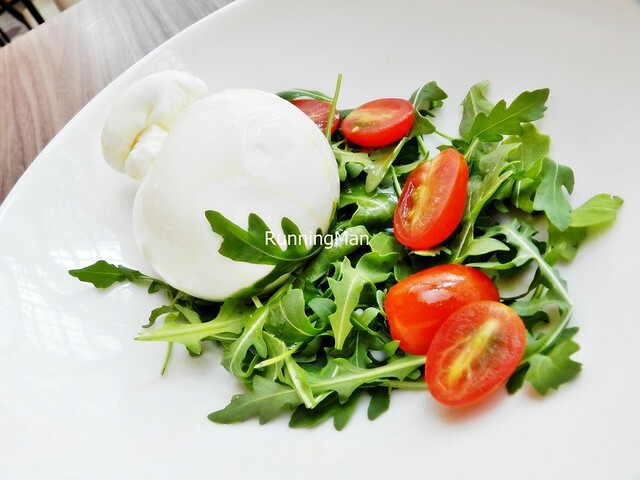 Served over fresh arugula / wild rocket leaves, and juicy cherry tomatoes, the cheese is clean tasting, so fresh, with a slight hint of sweetness, lacking bitterness. 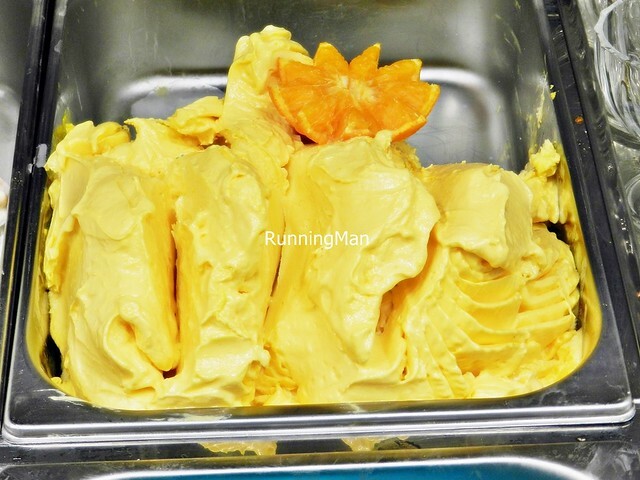 Has a rich, buttery, milky flavour. Good! 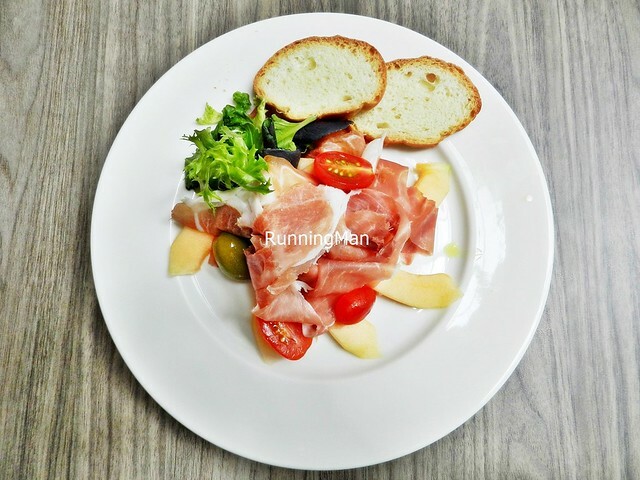 Loved the Prosciutto Di Parma Con Melone (SGD $15), with its generous slices of fresh and sweet rock melon, pairing well with the salty savoury, thin strips of parma ham. Juicy cherry tomatoes and a single, sour green olive rounds out the plate. There was a small and sad mesclun salad on the side, not good as it was dry. 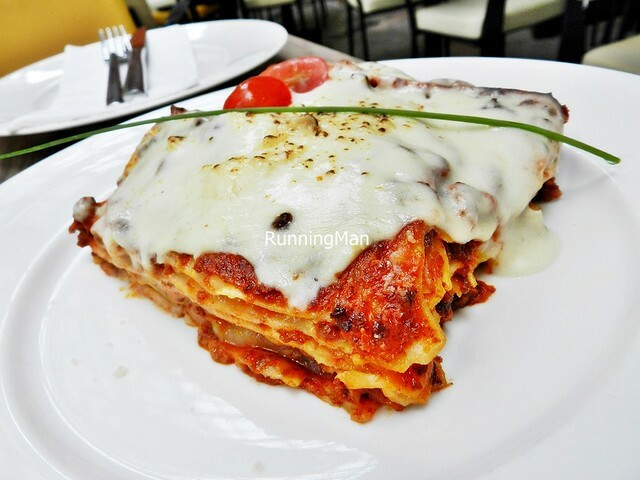 The Lasagne Al Ragu (SGD $16) arrives in a generous portion, warm and satisfiying. 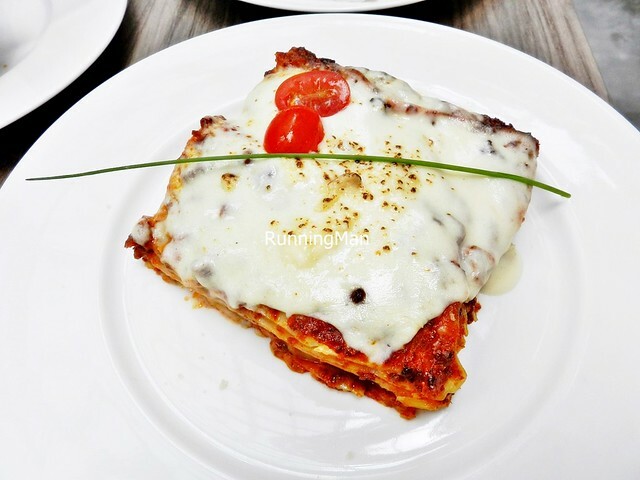 Straight forward, no frills, the layers of lasagne noodle pasta are well laid, and the beef bolognese ragu meat sauce is nicely savoury. 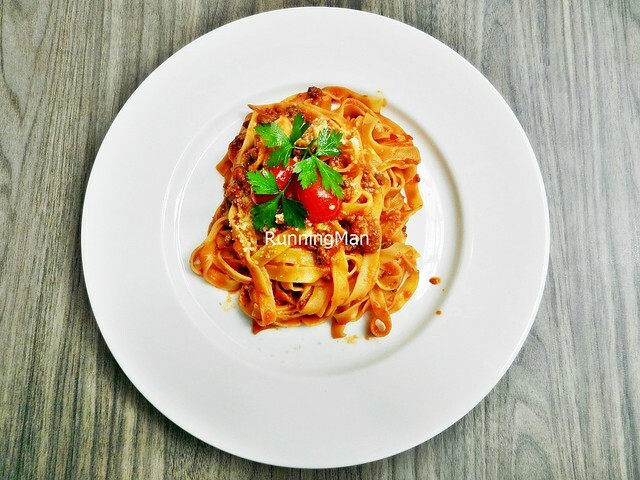 Could be better with less cream sauce, and it also lacks that bright sweetness of fresh tomato, knocking this dish into the decent category. Still, it's great value for money, possibly among the better tasting versions for this price range! 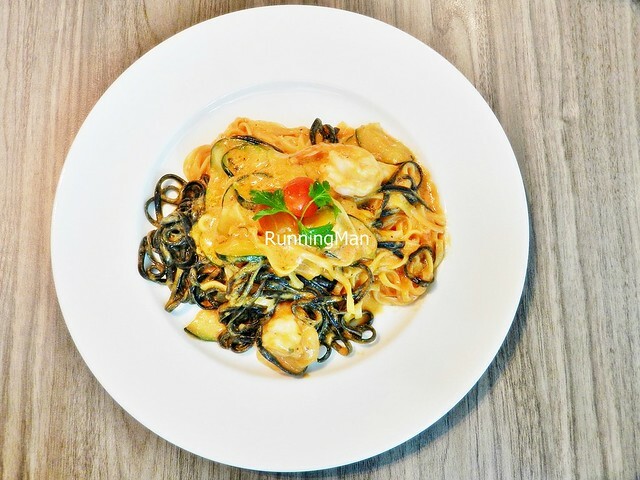 The Tagliolini Zebrati Con Gamberetti E Zucchini (SGD $18), or Zebra Tagliolini Pasta With Shrimp And Zucchini, features a visually pleasing duo of tagliolini pasta; a bright egg tagliolini, and a dark squid ink tagliolini. Pleasing to the palate as well, with its combination of al-dente texture, earthy and eggy tastes, and light cream sauce. The fresh, crunchy, thinly sliced zucchini round out the plate, along with 4 fresh but small shrimp / prawns. Completely delicious, and worthy of being a bestseller here. Highly recommended! 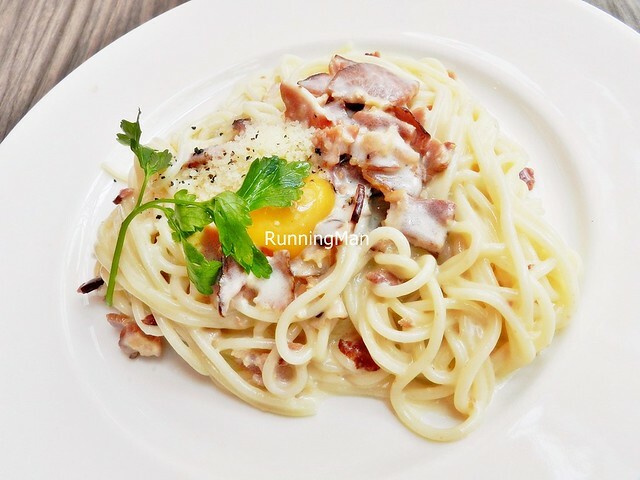 The Spaghetti Alla Carbonara (SGD $12) has a rich, thick, cream sauce, enhanced with a runny egg yolk, and savoury salty bacon strips. The spaghetti noodles pasta, instead of being done al-dente as per Italian tradition, is done till soft, which is apparently how most Singaporeans prefer it. Still, it's a good, straight forward dish, worth ordering! Felt the Tagliatelle Con Ragu Tradizionale (SGD $15) fared much better. 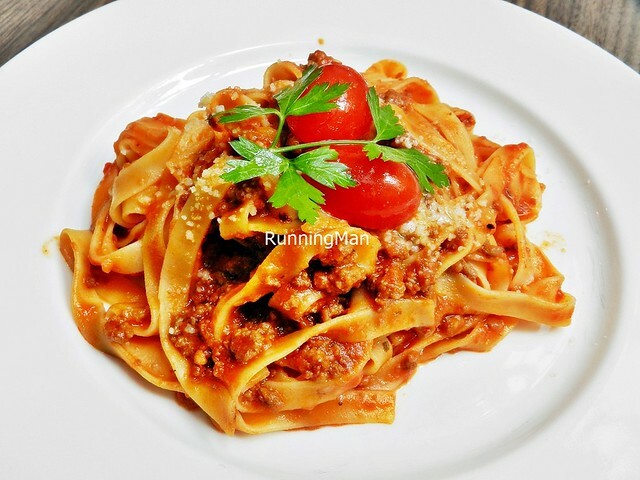 While it has the same tasty, savoury beef bolognese ragu meat sauce, I find it has more moisture in texture, plus, the portion is slightly more generous. The tagliatelle noodles pasta is done al-dente, with that slight bite, quite satisfiying. Good! 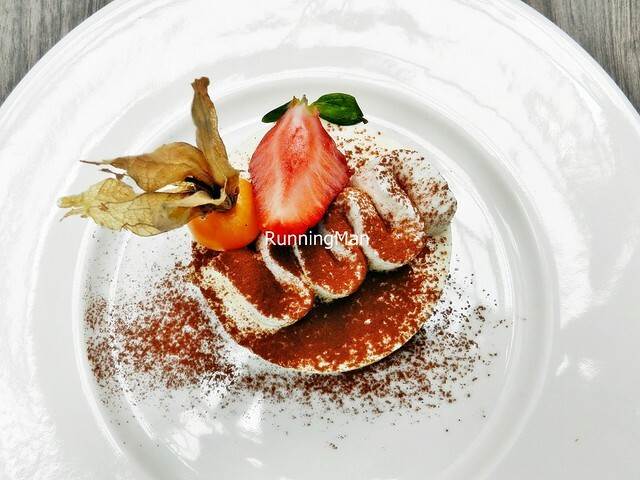 The Tiramisu (SGD $8) deviates from its traditional Italian presentation, but still retains its classic taste. 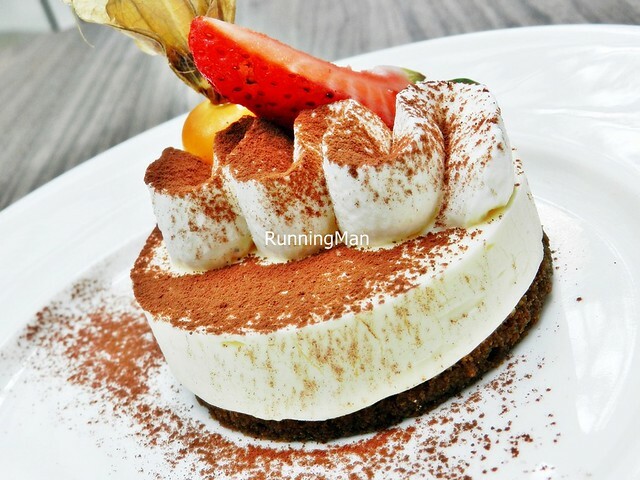 The espresso coffee soaked ladyfinger sponge biscuits form the base, on which sits the rich and creamy whipped mixture of eggs, sugar, and mascarpone cheese, dusted with cocoa powder, and garnished with a slice of strawberry. 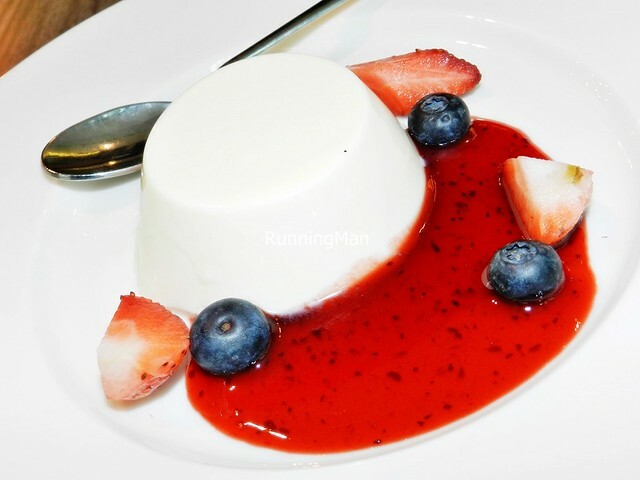 Despite its small size, the richness of this dessert can fill you up quickly! Taste is above average, worth ordering. 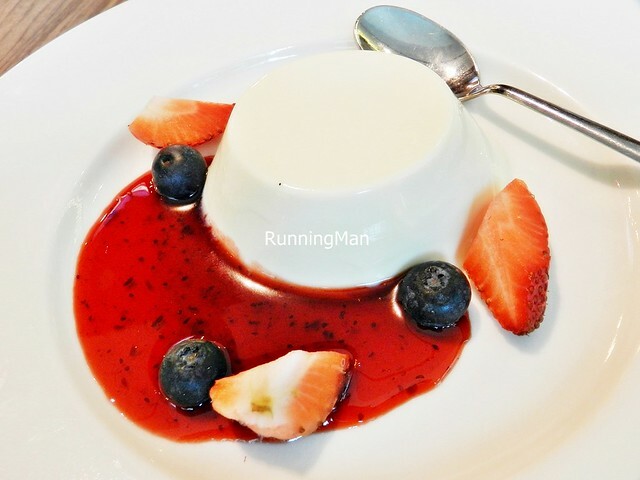 The Panna Cotta (SGD $7) features a sweetened vanilla pudding, rich with flavours of vanilla and milk, and with the correct wobbly, semi-firm texture. But what made this even better was the sweet strawberry compote, which brightened each mouthful, along with the juicy blueberries. Loved every bite of this. Highly recommended! 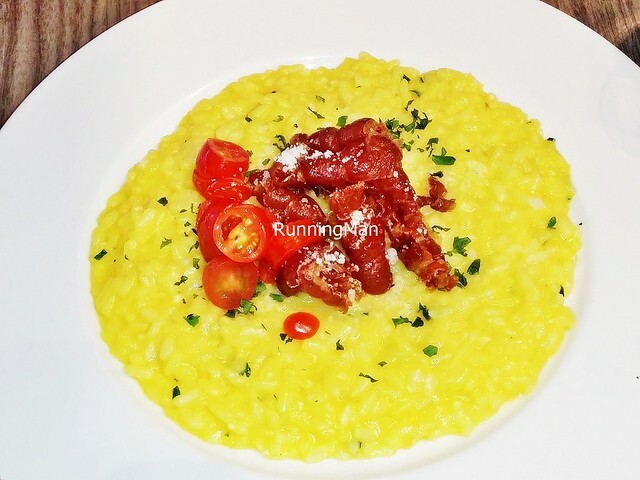 Update Jan-2016: The Cherry Tomato & Ham Risotto (SGD $18) is among the worst risottos I've ever eaten, with a taste and texture like congee; soft, mushy, and bland. Even the juicy cherry tomatoes, and salty crisp nuggets of bacon can't save this dish. Skip this. 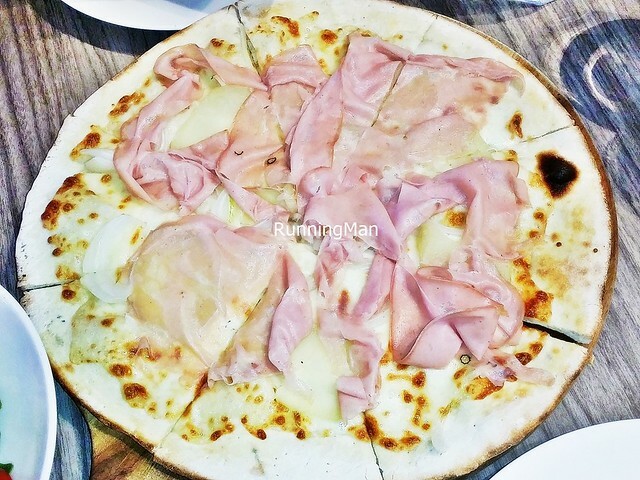 Update Jan-2016: The Pizza Hawaii (SGD $20) looks like a plain, unassuming version of the classic Hawaiian pizza, but at least it's pretty decent in taste. 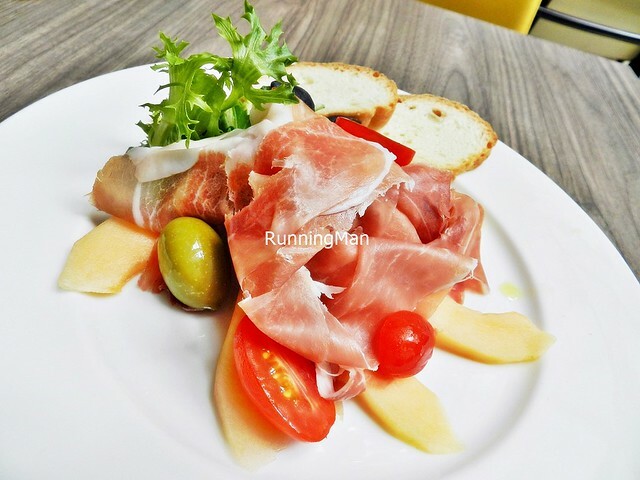 The fresh tomato sauce on the crisp, thin pizza dough is the star, complemented by the slices of juicy pineapple and onions, and savoury salty proscuitto cotto / ham. Frankly though, I've had similar tasting pizzas at cheaper prices elsewhere. 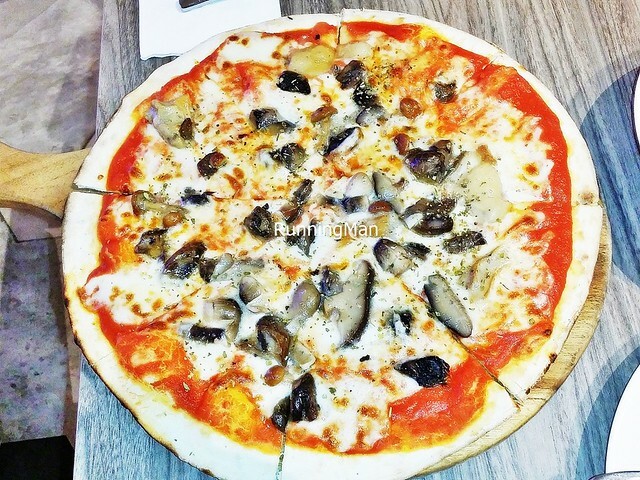 Update Jan-2016: Loved the Pizza Porcini (SGD $20), with its crisp, thin pizza dough coated in fragrant fresh tomato sauce, studded with a generous amount of porcini mushrooms, shiitake mushrooms, and straw mushrooms. The trio of mixed mushrooms have a beautiful earthy taste, but I didn't like the mushy texture of the straw mushrooms. Still, this is a very good pizza! 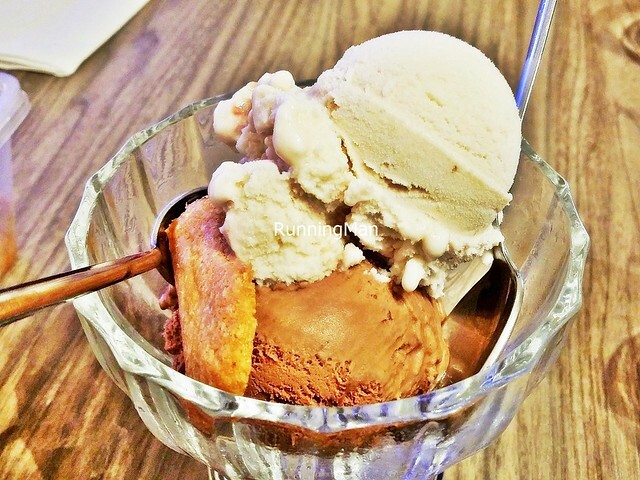 Update Jan-2016: Shared with her 2 scoops of ice cream, the Gelato Scoop Of Mocha & Sour Black Cherry (SGD $8). 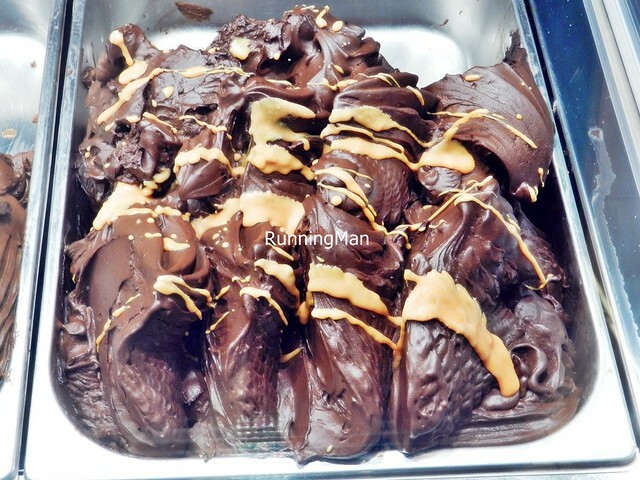 Love the rich, creamy texture of the Mocha gelato ice cream, with its floral hints of chocolate, and espresso coffee. 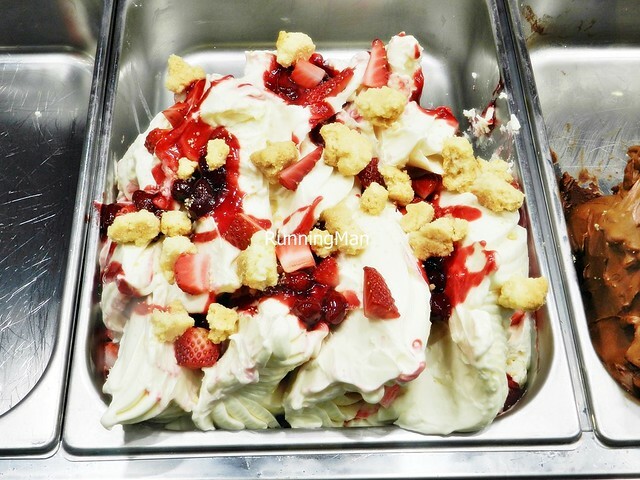 The Sour Black Cherry gelato ice cream has a slight sour sharpness, followed by a pleasant maraschino cherry taste.